Aspergillosis: Deadly Consequences? A serious threat? A report published in the Aspergillus Website Newsletter – September 2012 reveals that it is one of the top four misdiagnosed conditions with deadly consequences. Washington, DC — Aspergillosis is a medical condition of a hyper sensitive reaction by an individual’s immune system upon exposure to a fungus known as “Aspergillus.” The most common symptom is airway inflammation and other lung conditions. However, other conditions due to Aspergillosis may also include a localized infection, involving the nails, feet, external auditory canal and eyes, etc. This is one of the most commonly misdiagnosed aliments. A report published in the Aspergillus Website Newsletter – September 2012 reveals that it is one of the top four misdiagnosed conditions with deadly consequences. The common symptoms of infected individuals includes, but are not limited to, cough, coughing up blood or brownish mucus plugs, fever, wheezing, weight loss, blood in urine, bone pain, chest pain, chills, decreased urine output, headaches, increased phlegm production, shortness of breath, skin sores (lesions), vision problems, etc. Out of the hundreds of known species of Aspergillus, A. fumigatus is most common invasive, as well as, put, headaches, increased phlegm production, shortness of breath, skin sores (lesions), vision problems, etc. non-invasive types of “Aspergillosis.” A. flavus and A. niger are reported as the second and third most common causes of “Aspergillosis,” respectively. Other important species of Aspergillus that can cause “Aspergillosis” are A. terrus, A. amstelodomi, A. candidus, A. carneus, A. flavipes, A. nidulans, A. neveus, A. ochraceus, A. oryzae, A. repens, A. restrictus, A. sydowi, A. ustus, and A. versicolor. Several of the above mentioned species have been reported in and around indoor environments; therefore,Aspergillus exposure is not uncommon in residential and commercial places. It has generally been observed that dwellers with a compromised or weak immune system are more prone to acquire this infection in comparison to individuals with robust immunity. This fungus is a ubiquitous mycoflora of the environment, although, it also is reported from clinical specimens. It frequently occurs in soil, dead leaves, stored grain, breads, peanuts, dry fruits, rotting vegetables, cheese, compost piles, or in other decaying vegetation. In indoor environments, this fungus can be transported from outside or may propagate on building materials such as cellulose rich sheet rocks, etc. and can generally be isolated from floors, carpets, mattress dust, Heating Ventilation Air Conditioning (HVAC) system, etc. 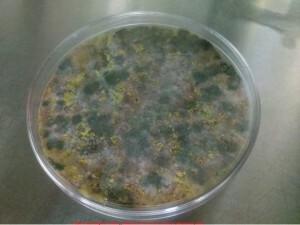 This fungi can adapt to extreme conditions for their growth; however, the most favorable growth factors include, but are not limited to, moisture above 60% and a temperature around 25ºC (this is a thermophilic fungus and some species can grow at temperatures as high as 50ºC) besides organic rich compounds. Some species of these fungi are known to produce mycotoxins. In routine investigations on environmental samples collected in and around indoor sites, the Environmental Diagnostics Laboratory at Pure Air Control Services, Inc. of Clearwater, FL has observed that Aspergillus Species is one of the 10 most frequently reported fungi from indoor environments. This fungus may be categorized as environmental or clinical, based on its source. In either case, depending upon its viability, this microorganism is capable of rapid multiplication and dissemination. The air dispersal of this fungus is rather common and significant especially due to their small spore size (3-5µm). Individuals can inhale these spores easily and may sensitize themselves for Aspergillosis. Therefore, continuous environmental surveillance is essential to monitor these infectious particles from a health and hygiene point of view in and around closed structures (home, offices, etc.). A number of techniques and methods are available for testing, both qualitatively and quantitatively, to understand the extent of Aspergillus in and around building environments such as healthcare settings, work places, offices, residences, and other habitations. The management of controlling, spreading, potential risk of exposure, and prevention of Aspergillus related infections can be facilitated by knowing the existence of these entities in our surroundings. For additional information on allergen/microbial assessment of your work site or home contact Dr. Rajiv R Sahay, Laboratory Director Environmental Diagnostics Laboratory (EDLab): 800-422-7873 ext. 301 or Alan Wozniak ext 802. Visit the online IAQ DIY superstore www.indoorairtest.com for all of your environmental testing needs. Alan Wozniak founded Pure Air Control Services, Inc. in 1984 as a small mechanical contracting firm and has since set the industry standard for indoor environmental quality diagnosis, environmental laboratory, and remediation. Pure Air Control Services has serviced more than 600 million square feet of indoor environments in over 10,000 facilities. The Environmental Diagnostics Laboratory (EDLab) (established in 1992) at Pure Air Control Services (PACS) is an AIHA accredited environmental lab offering complete and comprehensive indoor environmental microbiology laboratory services. They include: microbiology, aerobiology, chemistry, allergen assays, and microscopy designed to meet all your indoor air needs. EDLab supports IAQ investigations by assisting with strategic sampling plan development and supplying media collection equipment while performing a wide range of environmental analyses. The company’s expanding client roster includes the General Services Administration (GSA); US Army Corps of Engineers (USACE); Allstate Insurance; Carrier Air Conditioning; US Naval Air Warfare Center, Orlando; and Naval Air Station – King’s Bay, Georgia; and many other Fortune 500 companies, school boards, and city, state, and county governments, making Pure Air Control Services/EDLab the reliable industry leader in IAQ. For more information contact Alan Wozniak at 1-800-422-7873 ext 802.